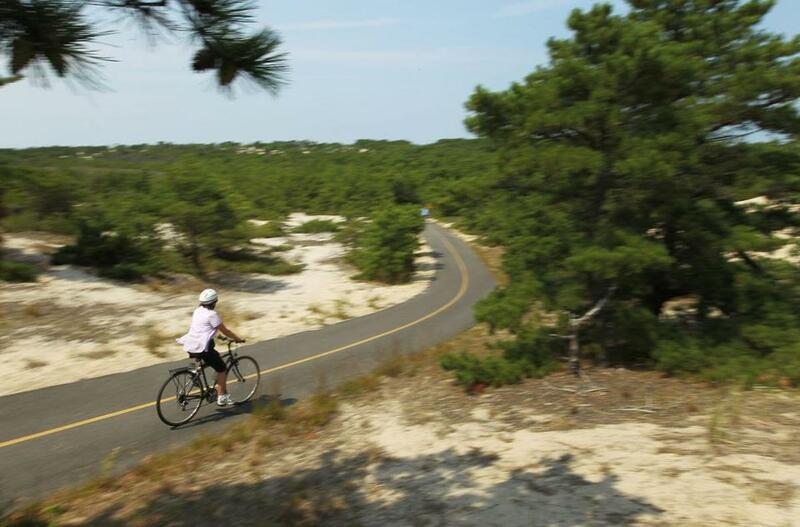 A woman raced down a steep hill on a path through the sand dunes of the Cape Cod National Seashore park in Provincetown, where Mary Oliver lived and wrote. I discovered Mary Oliver’s brilliance in a yoga class more than 15 years ago when a teacher read aloud her famous poem Wild Geese. You do not have to be good, the first line opens. And I was toast, lying there in shavasana. Because despite my best attempts at concealment, this is how my life felt at the time, characterized by a relentless desire to be good every waking moment — for everyone I’d ever known, might know, might interview for a job with, or share a T car on the Green Line. It was as emotionally exhausting as it sounds. If you have ever been a young woman, you do not need me to tell you this. If you have ever been a not young woman — not a woman even — you do not need me to tell you this. I learned of Mary Oliver’s death while standing at my kitchen counter reviewing edits for a recent article I’d written. My husband relayed the news from his Twitter feed, and my physical reaction is what was most memorable. My shoulders slunk, and for the briefest moment, I leaned all my weight into the countertop, feeling its chilled surface beneath my elbows. This is what it meant to love the poetry of Mary Oliver — it was visceral. My heart swelled in that first moment in yoga class. And in that moment at the counter, it cracked. In between, I leaned into her words in times when I needed a balm, for the same reasons everyone else did: to feel less lost. Or maybe more lost, as in the woods and marshes of Cape Cod, among the egrets, where Oliver lived and wrote for more than four decades. In that time, the world sped up exponentially, but the poet and her work kept the pace of nature. This, too, is what we loved about her. To read her was to slow down, listen for branches cracking beneath your feet, hear birds, observe tide pools, and remember how small yet assured was your place in the family of things. Even if you’d never been to these places, you felt as though you might belong there. You didn’t think of yourself as one for prayer, but how you felt when reading her poems might suggest the opposite. I kept her poem The Journey taped inside my medicine cabinet for years. I often read Morning Poem — Every morning the world is created — to my own yoga students in classes that coincided with special occasions, like the first day of spring or summer, or the opposite, a moment when our collective belief in warmth and light flags. Mary Oliver appealed to a broad audience, in large part because of her economical language and confiding voice. Yogis loved her, as did spiritual leaders, young people and old, celebrities and the rest of us. Oliver had her critics, too, but it must be said that she occupied rarified air, a commercially successful poet with a devoted following. She seldom gave interviews. She only ever seemed at home in herself, in nature, with a pencil. Tell me, what is it you plan to do with your one wild and precious life? Oliver asked. If you are young, the question urges, motivates. If you are old, it reminds, re-energizes. Life is precious. And wild. Nature is ruthless and luminous. Oliver captured all of it, and we were lucky to be reading along while she lived and wrote it. Rebecca Pacheco is a writer, speaker, and yoga and meditation teacher. She is the author of “Do Your Om Thing: Bending Yoga Tradition to Fit Your Modern Life.” You can connect with her on social media @omgal.